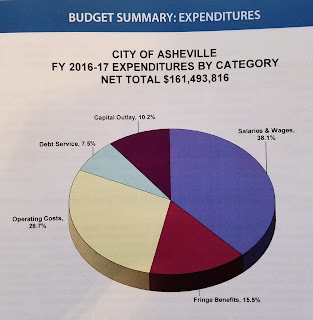 Asheville Unreported: City of Asheville Budget Highlights - where does the money go? City of Asheville Budget Highlights - where does the money go? Today is the 3rd and last budget worksession meeting held by the City of Asheville as they prepare to release the first draft of the 2017 fiscal year budget. It will cover the Capital Improvements Program (see below) which last year was $27 million of the operating budget. $161 million was the 2016 budget. Of this, $95 million is for salaries/wages/benefits (53%), the largest expenditure. This year the City proposes another wage increase of roughly $1.8 million. $16.4 million is spent in capital outlay - streets, greenways, new equipment, etc. $27 Million Capital Improvements Program - today's budget meeting is to discuss the CIP (Capital Improvements Program), a rolling 5 year plan to pay for Capital Projects. The total last year for the 5 years was $149 million. $27 million of this comes from the City's operating budget and they project approximately $110 million will be paid for through debt.